Reporting is by its nature an exercise in interpretation and reconstruction by language, and this becomes ever more apparent when the practical function of language — understand me and these words I say — breaks down. My Spanish, for instance, isn’t very good, and so I recently required the presence of interpreters while documenting a story about immigrants, my neighbors, here in rural North Carolina. 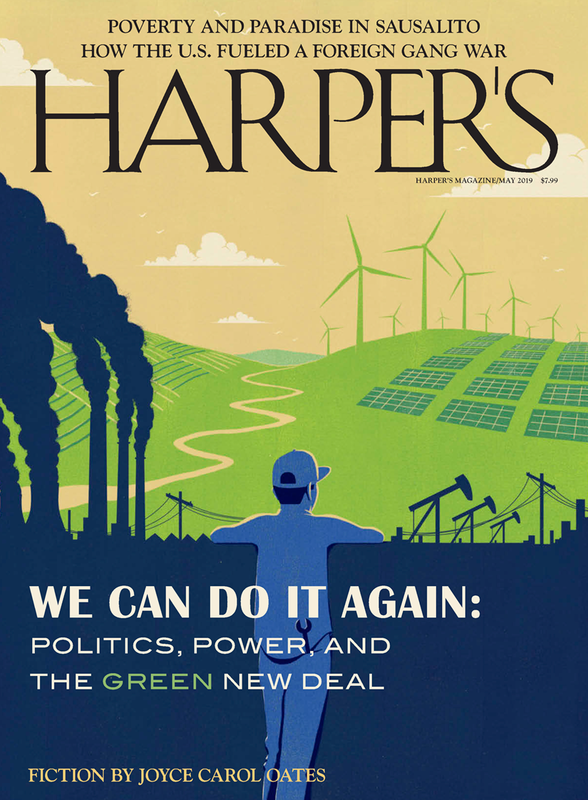 Read contributing editor Duncan Murrell’s feature “Jump Juan Crow: A Southern family struggles to avoid deportation,” reported from North Carolina, in the December issue of Harper’s Magazine. At first I was ashamed of my ignorance and irritable about the awkward, rickety exchanges that ensued between the three of us — subject, interpreter, observer. These could hardly be called conversations in the most familiar sense. If I participated in a conversation at all, it was at first merely as a source of raw data for conversion. I asked questions and waited for my words to be coded and compiled into new and unintelligible forms, until finally returning to me as answers. In the lag, with nothing better to do, I began to pay attention to the signals and gestures — the physical language — of the people in the room, at least as much attention as I paid to the words that came back to me. My notebook is full of body language and blocking, like stage directions. I became concerned that my interpreters were not delivering my words in the way I delivered them and in precisely the way I meant them. Often I thought I detected something harsher in their voices, something more judgmental and emphatic, delivered with more control than I could have managed myself. I hoped this was merely an effect of my ignorance, that what I heard was only a structural difference of language. The strange language withholds. To this outsider, at least, it appeared a repository of mysteries, and I felt berated and chastened in ignorance. The strange language seems authoritative and rings out as if naming worlds unknown. To my ear it sounded urgent and insistent, even threatening in a way that excited. I saw that the words, interpreted and polished, contained unknowable traces of the interpreter who, try as he may, could not slough off his own history and structure of knowledge, his philosophy and desires. I watched my subjects’ faces, learned to recognize in them the flashes of pleading, self-satisfaction, comedy, slyness, and sadness; to see and note the flinches, arching eyebrows, flurries of hands, sags, shudders, shrugs, and the periodic shuttering of the eyes. With this knowledge I tried to interpret the words that came back to me and to observe, however obliquely, how they may have been transformed. I began to interpret the interpreters. One of my interpreters, Roy Stawsky, tried to reassure me. His work contained no traces of himself; he had been entirely scrubbed from the operation. He described his work, and himself, as something more like a membrane through which words passed and accrued value — intelligibility — for the listener. At different times he described himself as a living entrepôt, or an energized antenna, or a machine. He was nothing, he said, and it was best if all parties pretended he didn’t exist. In court, where he did most of his interpretation work, he corrected judges and attorneys who spoke to him and not to the accused. As if to emphasize his own mechanical nature, Roy lugged a case with him everywhere, stamped “Williams Sound Corporation,” containing the FM transmitter, headphones, and mouthpieces he would strap to himself while standing in the dock. While working he kept an earphone in one ear and spoke rapidly into a microphone hanging at his chest, his head bent as if in defeat. He stood neither facing the judge nor his client, but at some kind of golden angle between them. He was a remarkably fast interpreter. His full name was Max Roy Stawsky, a Uruguayan by way of Argentina, a big man with a shaved head who looked Russian. His father had been a Jewish immigrant to Uruguay, his mother had been a daughter of whatever is left of the Spanish plutocracy in that country. He wore Italian suits, ties printed with Picasso motifs, and talked about flow, the ineffability of love, and the ways language shapes the mind. He was an artist and a painter, too, and when referring to his art he sometimes called himself Luis del Rio. Sometimes he was Max, sometimes he was Roy. I never really understood why he and his family had come to live here, in rural North Carolina, but Roy didn’t seem regretful about it. One day I made light of Diego Maradona, the Argentinian fútbol hero who famously struggled with cocaine and his weight after the end of his playing career. Roy fumed and gaped at me before saying that he would one day show me how wrong I was about El Diego. I didn’t understand his response, nor how I had wounded him by not properly reading the meaning of the Great One. Roy had been in the middle of making his Amazing Black Women paintings in 2008 when he got the call to fly out to Iowa and act as an interpreter in some kind of federal court proceeding, the nature of which would be revealed to him on arrival. This wasn’t an unusual amount of secrecy, and to be asked all the way out to Iowa was something of a compliment. He boarded a flight and arrived in Postville, Iowa, just after Immigration and Customs Enforcement had completed its infamous raid of the Agriprocessors meatpacking plant, arresting 389 people (290 Guatemalans, ninety-three Mexicans, four Ukrainians, and two Israelis) and charging them with aggravated identity theft, a felony. At the time it was the largest workplace immigration raid in U.S. history. Those arrested were held and tried at the National Cattle Congress facility in nearby Waterloo. The facilities at the National Cattle Congress had been commandeered for a makeshift set of jails and courtrooms in which to charge, try, convict, and sentence the 389 arrestees in just a few days. Roy thought it looked like a big circus. During that week most of the accused would appear before judges five at a time, shackled together and cuffed, to be sentenced to a few months of jail time before deportation. Roy Stawsky was there to interpret and explain, even for the significant number of indigenous Mayans from Guatemala who spoke neither English nor Spanish very well. It all looked legal, Roy said, but it all looked very wrong to him, too. On the first day the interpreters and other officials took seats in the stands of the rodeo arena to await the arrival of their clients in buses. It was then that the essential human problem of what they were doing became glaring. Roy had come from South America, in his case Argentina and Uruguay. In language, the meaning of words like stadium and arena remain relatively stable through successive translations. Most of us have a relatively good idea what happens in a rodeo arena. But for a select group, the words arena and stadium exist in a different syntax; they’ve accrued strange meanings that are possibly untranslatable. “Throughout Latin America, stadiums play a double role,” the writer Ryszard Kapuscinski once wrote. “In peacetime they are sports venues; in war they turn into concentration camps.” Roy said he felt a terrible weight when he saw bus after bus arriving at the arena. He watched line after line of people shuffle forward from the buses, people he recognized as mothers, fathers, country people, and street people, but not as criminals. He saw that they were mesmerized by what was happening to them. He watched them stare and search, from the bus to the ring to the stands above where he himself sat, a child of Argentina, raised on the news of torture in fútbol stadiums. He stayed the whole week, interpreting. Sometimes he took phone numbers from the accused and returned to his hotel room to call their families and friends in Guatemala or Mexico. He told the families that their loved ones had been detained and held in limbo, on territory in a cattle palace that had been transformed into a littoral, transitional area; that they were neither here nor there, caught between identities, citizens of nowhere. Ciudanos de ningun lugar. And afterward he returned to Chatham County to his paintings and his pots, and swore he would never again participate in an immigration raid. To my knowledge he has kept that promise. I watch Roy in court back home, and most of the time he looms over the defendants, both taller and broader. I notice that he doesn’t stay strictly on his golden angle between the judge and the defendant, but inclines his head slightly toward the defendants. He brings books to leave on the table by the holding cells, books in Spanish, but they disappear quickly. Sometimes his clients are charged with drug crimes, sometimes driving violations, sometimes for fishing without a license. Often there’s time to stand around with the client before court goes into session. Sometimes they ask why the police stopped them, how the police could have known they didn’t have proper papers before they were pulled over on the highway on the way to work. Maybe they didn’t know, Roy says, but does it matter? Who knows what they read in your car, in your face? The price of finding out would be more jail time awaiting trial, and the final result would be deportation either way. Very few people choose a trial, in Roy’s experience. After court one day, he stays with the family of a man who has just pled guilty to the criminal charge of re-entering the United States after being once deported, and is now making his way through the system to his second deportation. His mother stands close to Roy, and his two children, a girl and a boy, ages ten and eight, stand beside her. Everyone is recovering from crying, the lawyer is speaking, Roy is interpreting, the drawstring bag on the woman’s shoulder reads Nationwide: Esta de tu lado. When it’s over she thanks Roy and takes the kids out of the courthouse. Roy puts his equipment in his rolling box and looks around. He’s ready to leave. Here is the second goal that Maradona did to England in that same game, just to establish that he was The King of Soccer and not some lucky guy playing dirty. It was, to many, the best goal scored in a World Cup. (That game was loaded. The Falkland war with England was in 82, and it was the first time that England and Argentina had played since then). So it was like at the end we could have sung “I did it my way . . .”: A mischievous tricky goal that would hurt forever, as if done in a pick up soccer game in our barrios, and then another one to establish credibility, to say that we know and master the beauty of soccer. Two goals. This is, finally, what I needed to know about Roy to understand him when he interpreted for me. This is his territory: the untranslatable and unbridgeable divide where he lives between here and there, the eternal littoral, where it’s the barrio versus everywhere else, where most of the world is most definitely not esta de tu lado, on your side, where this man is Roy and Luis del Rio, where he is unreadable as an Argentinian until he opens his mouth, where a boy might idolize a barrio king who could write in the language of trickery and instinct the history of the Buenos Aires streets and Borges’s stabbing and slashing outlaws, and could take up the very different and elegant physical language of international fútbol, of speed and countermove unrivaled, leaving several hapless English defenders powerless and mute.